In 2006 they purchased the beautiful property in the valley of Cachapoal in Millahue, just two hours from Santiago, and decided to initiate a contest with five Chilean architects. The five architects were challenged to blueprint a thoughtfully creative design that would have minimal impact on nature while using cutting edge advanced technology that’s efficiently operated to achieve their objective of maintaining a high-density plantation. The contest consisted of five Chilean architects from various stages in their career, three being very well known architects, the fourth an architect who was in the profession for a short period of time and the fifth was a student who was recently graduated from college. In 2007, the architect design competition came to an end while choosing to lead the design of well known architect, Smiljian Radic, in association with Loreto Lyon to assist the unique groundbreaking design. Both architects came together in order to bring the Vik’s family dream to redefine the tasting experience in a highly sustainable vineyard, state of the art winery and resort. Everything was organized and thoughtfully mapped on this property with meticulous attention to detail, prior to building and planting of the grapes. In 2006, they extracted over 4,000 soil samples to determine ideal soil locations within the different micro climates for the planting of the grapes. Wind conditions were tested and Calicatas, also known as “soil pits”, were extracted, a process where six feet holes are dug up in order to determine the most suitable variety for that particular microclimate and terroir. At the time, there were no roads and the team used horses throughout the hills and forest like mountains to search for the most ideal places to plant the vineyards, winery and resort. The initial plantation and selection of rootstock were analyzed after a thorough land exposure and meteorological studies in order to seek harmony between hydric balance, climate, soil and rootstock. At the end and with the help of Chilean winemaker, Cristian Vallejo, the varieties selected that were best suited for the VIK vineyard were Cabernet Sauvignon, Carmenere, Syrah, Cabernet Franc and Merlot. In addition, after 1,000 acres were planted around the 10,000 hectares of forest, they added an additional 590 new trees in order to reduce their carbon footprint. The property has over 12 micro climates and 13 soil types with hills and mountainside at different altitudes, providing very different characteristics between the grapes. These factors allow for different maturity rates between each vineyard, allowing the winery to collect the grapes at different times during the season while maintaining quality hand harvesting. Direct coastal breezes from the Pacific Ocean cools down the vineyard, playing an essential part in maintaining a healthy vineyard. Some of the vineyards are south facing and others are north facing, providing a different concept for each individual vineyard. In addition, VIK Winery has their own water treatment plant in order to reuse the water for the irrigation of the vineyards. They also have an irrigation system that is designed to control hydric conditions. According to VIK’s winemaker Cristian Vallejo, the winery focuses on quality not quantity, growing about one kilo per plant and therefore producing less grapes with more hectares. Around December, the team goes out to the vineyards to inspect the grapes. They cut the grape clusters that don’t meet their standards so that most of the energy and nutrients go to the remaining grapes on the vine. He indicated that 2/3 of the grapes are sold to other producers, while keeping the top grapes for their own wine production. Construction on the winery that was designed by well known Chilean architect, Smiljian Radic, began in 2013 and it was completed in 2015. It took three years of continuous improvement on the design in efforts to have the least amount of impact on the environment and vineyard while fulfilling the Vik’s family dream of producing one of the best wines in the Country. 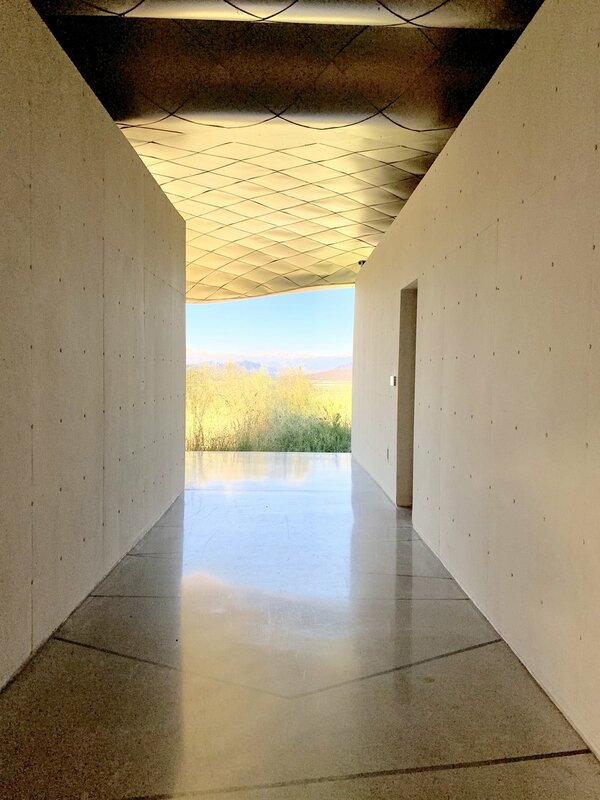 The designs of architect, Smiljian Radic, have always been reflective of respecting nature and his concept and mission for the facility's design was to have the winery incorporated into the vineyards, rather than the winery being the focal point. The concept was to build an eye catching facility that would shift the guests perspective and making a visual impact as they enter the winery. The idea was knowing that you are approaching the winery, however not knowing what you’re going to see. As you walk through the vineyards, the white permeable roof top is the only thing visible above the valley floor, allowing the guests to appreciate the linear vineyards and the terroir rather than the winery. As you walk closer to the winery, all you see is concrete walls, following a water sculpture feature streaming across your entire field of vision. The mesmerizing “wow factor”, that the winery provides follows with a two degree sloping plaza of running water streaming over the ground floor, which provides an additional cooling element to the barrel room below. The granite boulders and rock feature represents the diversity of the surrounding vineyard with additional long, elegant linear lines of walkways. The walkways that lead toward the production facility are simple, with the water appearing to drop off the edge of the property facing the Andes mountains at a distance. The winery and production facility is where most of the technology and science come together. One of the main concepts of the winery, along with the white stretched fabric roof, is the transparent design that allows for natural sunlight to permeate the inside of the winery and therefore, operating without artificial lighting. The fabric roof was also designed as a barrier between the production room and the cold and hot weather conditions, creating ideal temperatures in the production facility throughout the year, using minimal amounts of energy. Further, solar panels were installed throughout the properties as a supplemental feature for additional energy use. As you enter the winery and production facility on the second floor, the “wow factor” continues with floor to ceiling windows on both ends, giving the visitors a view of the pavilion through the other side of the facility. The majority of the production facility is located underground to naturally cool the wine making process by maintaining a consistent temperature using natural thermal amplitude of the valley. During the hot summers and cold winters, the respective outside temperatures are not felt due to the permeable roof. Therefore if the temperature of the wine needs to be increased or decreased during fermentation, less energy is used. During harvest, the winery performs up to three night time manual harvests when the grapes are the coolest. They maintain the highest quality of the grapes, with manual cluster collection in small bins and never dumped into large tote bins. The area where the grapes are processed is very selective, as they're transported by gravity in the small bins and received on the second floor. First, the grapes are placed on a table to sort the best cluster of grapes, while getting rid of the ones that don’t meet their criteria. One of the practices that sets them apart from other wineries, is the way they have revolutionized their grape sorting. As they go through a gentle destemmer the grapes fall onto a moving plate that separates them in shunts and onto a conveyor belt that will get processed in one of the state of the art machines in the wine industry, an optical sorter. An optical sorter machine is the best and most accurate grape-sorting equipment on the market where the berries pass on a conveyor belt and onto a halogen light. The sorter employs a high speed camera and imaging processing that can quickly scan and sort destemmed grapes. It will cross reference each berry’s shape, size and color with the winemakers specification and rejects those that fail to meet those requirements. It’s important to note that prior to going through the optical sorter, the berries are hand sorted and only passing four small bins at a time. In addition, they go through the berries that passed through the optical sorter for a secondary inspection for mechanical error of berries that went through the sorter by mistake that did not meet the criteria. The berries that are rejected, drop onto another bin where they’re made into mulch and compost and used as fertilizer on the soil. Once the ideal berries are chosen, they’re placed in a rolling machine that they call, “The R2D2” (only because it looks like R2D2 from Star Wars), that transports them throughout the winery on the top level runway. The grapes are transported by gravity in the evenings, onto the crusher tanks that are on the lower floor, in order to maintain optimal freshness of the fruit and aromatic precision. Again, this is all processed at night because the grapes are cooler due to the night temperatures in Chile being 46 to 50 degrees Fahrenheit (8 to 10 Celsius). This allows the grapes to come in at that same temperature, falling easier onto the presser, and avoiding the grape skins to break with seeds passing through the machine. After the press, the grapes are brought into the vats at the same temperature as outside (46 F), avoiding to reduce or increase the temperature of the grapes and using less energy. Once the grapes are brought into the vats, cold maceration is done for a period of four days at 46 degrees, same temperature as the evenings in Chile. On the lower level all the stainless steel tanks and vats are located. In addition, there are two barrel rooms where the French oak barrels are stored during aging. The main barrel room is the one that is located underneath the water cooling feature that is at the entrance of the winery. As stated before, the water feature cools the barrel room making it feel like there’s air conditioning running, however, no air conditioning is used in that barrel room. The barrel room is kept as clean as possible in order to avoid smells and aromas that are not natural or native to the wine. They exaggerate their cleaning in the barrel room because they believe that every detail is important to aging. They believe that not only the terroir and production is important, but also all the other small details that can affect their wine production. The second barrel room is called the “Romantic” barrel room, due to its design and connection with art and the winery. The concept of the “Romantic” barrel room is to provide not knowing what is beyond the garage looking door. Once the large door opens, the dark room slightly lightens with a golden light that draws you to the back of the room. The golden light is a representation of Millahue meaning, a “place of gold”. Soft lit barrels are perfectly lined up, forming a beautiful walkway leading you to the golden light at the end of the hall. At the end of the walkway, is a painted art display by Eduardo Cardozo, that covers the entire wall as an interpretation of the layers of the vineyard and terroir of the VIK property. The passage way to the Golden tasting cave was carved to represent the soil pits, “calicatas” with the roots painted on walkway walls. Once passing through the passageway, a golden tasting cave is waiting for guest to taste through each individual block. This tasting is designed to have guest’s understand how each individual variety block plays a part in the blending and how their characteristics influence the process. During the tastings, guest will experience a unique tasting of each individual varietal planted, in various completed stages along with the three wines that VIK winery produces. The owners, Alexander and Carrie Vik also crated this tasting cave so guests are able to make the connection between the art, the tasting cave, and the retreat, especially for those guests who only visit the winery and are not staying at the property. The tasting cave is a point where architectural art, the actual art itself meet together with wine, as winemaking is an art. After wine tasting, guest can enjoy a delicious meal at the Milla Milla restaurant at the Pavilion, overseen by executive chef Rodrigo Acuna Bravo. The restaurant design has the same idea of keeping a holistic concept with cuisine made from local and seasonal ingredients. The restaurant is surrounded with one of a kind art sculptures by Marcela Correa and floor to ceiling windows with endless views of the VIK property. The menu changes daily according to what food is available, served along the delicious VIK wines that are made at the facility. Viña VIK’s strives on competing to be the number one wine producer in Chile and in order to achieve that, they’re willing to make the extra effort. Viña VIK focuses on quality not quantity, growing less grapes per plant with more hectares. The winery produces about one bottle per plant with approximately 15,000 cases per year, making three Bordeaux style red blends and one rosé blend. Winemaker Cristian Vallejo, stated that bottle blending is a guided process of assembling wines from various individual blocks and varieties to accomplish his vision of the completed wine. He’s constantly tasting individual block samples throughout the years until the variety has reached optimal levels for blending. Wines are aged in French Oak barrels approximately 18- 24 months and then left in the bottles for an additional period of time. The importance of science and technology are the elements that were adapted to each valley and vineyard in order to achieve the optimum maturity levels on the fruit to create the best wine. Viña VIK also thought about the details on the labels for each of the three bottles in order to show their dedication for nature and art. At this moment, they have released four bottles, VIK, Milla Cala, and La Piu Belle and their first experimental Rosé blend. Their flagship wine is VIK, a red blend which was also named the number three wine of the top 50 best wines of 2018 by Vinepair. The 2013 VIK is their wine where they strive to produce the most perfect bottle using only the best grapes on their property. This bottle is considered their highest quality wine and when tasting it, gives the impression similar to reading a book, with every sip is a new page telling you a story. An elegant and complex red blend with similar characteristics of a Bordeaux, made up of 67 percent Cabernet Sauvignon, 17 percent Cabernet Franc, 14 percent Carménère, and two percent Merlot. This wine was so cheerful with an elegant deep ruby color, intense aromas of mixed red and dark fruit flavors. Precise, tense, but yet soft silky tannins. This wine was also fruit forward and fresh, which is typical for a Chilean wine. With minimal flavors of mocha and a slight touch of mineral on the palate, rounds up for a silky long finish. For being aged 23 months in French oak barrels, the oak did not dominate. This wine has almost perfect fresh acidity and it can be aged up to 25 more years. The details on the label for the VIK bottle is very significant to the land of Millahue. When they designed the label, they realized that when the letters are turned around, it looked like the mountains and valley. The “K” and the “I” stand for the mountains and hills of the various micro climates on the property and the “V” stands for the valleys below. The Milla Cala red blend was recently featured at #22 in Wine Spectator's top 100 wines of the year with 94pts for their 2012 bottle. The 2014 Milla Cala is 21 months in French oak barrel with 54 percent Cabernet Sauvignon, 28 percent Carménère, 12 percent Syrah, four percent Merlot, and two percent Cabernet. This wine is an intense wine with a complex and elegant bouquet, and fresh ripped fruits, such as strawberry, blackcurrant, strawberry, and blackberry. It also had notes of plums and almonds, finishing with a hint of black and white pepper, and subtle coffee notes. On the palate, its complex, nice fresh acidity with a long finish of rounded tannins. Comparing this wine to the VIK wine, Milla Cala is just as complex, but more fruit driven, easier to drink and a shorter finish, while still maintaining a long finish. The wine label on this bottle has two significants. The “Milla” means gold and it comes from Millahue, which means “Place of gold”. “Cala” is the direct translation of “VIK” in spanish and representing the closest point to the land. After the bottle was named, they realized that “Milla Cala”, had the name of one of their daughters, Camila. La Piu Belle 2012, which means, “the most beautiful”, is a fruit driven wine made of 50 percent Cabernet and 35 percent Carménère, six percent Cab Franc, five percent Merlot, and four percent Syrah. Out of all their wines, this bottle is the one with the largest amount of Carménère, with 23 months in French oak barrel. The Carménère in this red blend brings out the personality and structure to this wine. Notes of black fruit, violets and a subtle wet forrest floor mid palate, brings this wine together for a linear finish. The wine is fruitful, very linear, elegant tannins and the most beautiful concentrated mid palate. Viña VIK’s Carménère is on sandy soil and is the last to be picked on their property so that it has more time to develop the skin. The wine label on this bottle was designed by Rodrigo Cien Fuegos, along with three other wine label designs. Owner Carrie Vik walked into the “Cienfuegos” Suite at VIK Retreat where the three bottles were placed. Her eyes went straight to his bottle and she said, “that’s the most beautiful”. They decided that their wine label for this brand would be named La Piu Belle. La Piu Belle means, “the most beautiful”. The 2018 La Piu Belle Rosé blend was their first Rosé with a small limited production. Winemaker Cristian Vallejo wanted to experiment with a Rosé in order to show the freshness and fruitful characteristics native to VIK’s terroir. His desire was to produce something different to demonstrate those profiles in a different form instead of a red wine. This Rosé is a blend of Cabernet Sauvignon, Cabernet Franc, and Syrah, where these three varieties are able to express themselves in a fresh and elegant form. Notes of strawberry, plum, and black currant following floral aromas of violets and lavender. The mineral notes makes for a complex and profound palate with a rounded finish. Vik Chile Retreat, along with the winery, was designed so that guests feel at home while connecting their senses to their surroundings. From the gated entrance at the bottom of the mountain, a long dirt road will lead you to the top of the hill where the avant-garde retreat is situated overseeing the entire Chilean nature and vineyards. From the top, you’re able to see the high rising Andes mountains at a distance, along with the white rooftop of the winery. The retreat was completed in 2015, on a picturesque biodiversity location with animals such as ducks, swans, birds, and eagles surrounding the vineyards that encourages healthy development of plants and a good balance of the wildlife. The all inclusive retreat also runs solar panels and their own water treatment plant in order to reuse the water and irrigate the vineyards. Each guest stay includes all meals, wine, horseback riding, hiking, trekking and mountain biking. Spa treatments are additional. The floating roof of the retreat is made out of titanium that has thermal capacity to withstand the climate of the Chilean sun, changing colors to gold and silver depending on the angle of the sun. The lines on the roof reflects the lines of the surrounding mountains providing a unique and avant-garde titanium rooftop that feels like its a modern piece of art. As you enter the retreat, you’re made to feel like your entering someone’s home with a welcoming living room reception area and floor to ceiling windows that give you views of the Andes mountains. Two large canvas paintings by Roberto Matta and a diptych from Anselm Kiefer’s iconic, “Secret Life of Plants” series, surround you along with unique furniture that appear to be works of art. The 22 rooms are scattered on the outer edges of the square like property and surrounds a relaxing Asian influenced garden with bright colored flowers planted on the ground. Each room introduces guests to talented local artists with a unique design thats is not the same to one another. Each room and bathroom was designed by a different artist with the approval of owner, Carrie Vik with at least three pages of designs per room. The cantilevered slate pool that feels like its floating over the hill, is one of a kind. As you step out onto the deck, you’re immediately taken back by the valley views that surround the property. The infinity pool drops off onto the edge of the property, making you feel like your floating over the hills. The Miila Milla restaurant has the same concept as the Pavilion Milla Milla restaurant located on the winery. Ran by executive chef Rodrigo Acuna Bravo, guests are offered three and four course meals with two separate main dishes options to chose from. Every dish is detailed and perfectly matched with VIK’s impressive wines. The seasonal cuisine is sourced from local areas, along with their small plantings from VIK’s personal garden and fresh honey. When their cherry and orange tree orchards are ready, you can bet you will see cherry inspired dishes at both restaurants. The spa at VIK is also a one of a kind experience. The signature spa offers various custom wine treatments ranging from massages, facials, wine baths, body scrubs, skin care, hair and scalp treatments. All products used are developed from their own terroir where the polyphenols from the grapes seeds and resveratrol from the vines provides superior anti aging, moisturizing and anti inflammatory elements. The spa also offers a sauna, yoga and fitness classes. To be able to create a highly sustainable vineyard and redefine the tasting experience in a state of the art winery and resort, is not an easy task. It takes time, passion, and planning with a conscious effort to refine the project throughout the years. Since the property was purchased, the Vik family has not only made their dreams come true, but they’ve also maintained their holistic concept of qualitative perfection and not quantitative. At the same time, they’ve sustained the highest standard of Chilean winemaking and luxury retreat while optimizing every natural resource on their property. The importance on focusing on art, science and technology, were the elements and mission that were adapted to every aspect of the project in order to achieve the optimum luxury winery and retreat. Viña VIK’s goal for creating a Chilean Premier Grand Cru, while maintaining minimal impact on the environment, is certainly on its way and it’s being achieved at the highest level with science, nature and technology. Thank you to Viña VIK staff, and MCC for their support during this trip. A special thank you to winemaker, Cristian Vallejo for his time during my stay. Content was gathered during my visit in November 2018. Interview with Cristian Vallejo was recorded with his permission.